Blessing Ikpa: Tell me about who you are and what your current position is. 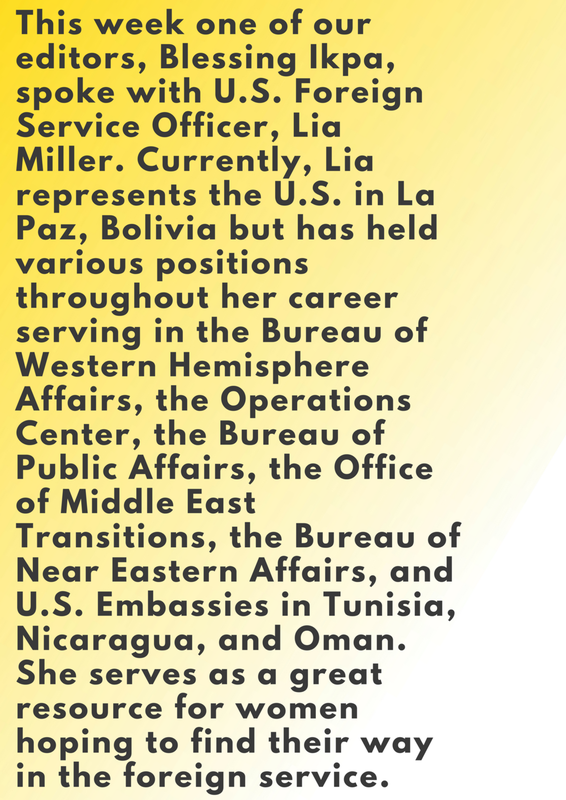 Lia Miller: My name is Lia Miller, and I am a career foreign service officer. I’ve been with the State Department for fourteen years now, directly from graduate school, and my current position is as the Cultural Affairs Officer at the US Embassy in La Paz, Bolivia. BI: What led you to this point, and what was your path into and through the foreign service? LM: I’ve always had the traveling bug, and my family always had the luxury of being able to travel. Once my grandfather retired from government service, he and my grandmother opened their own travel agency. I remember being young, coming home from kindergarten and going to the travel agency, which was connected to the house every day after school. I have always had this curiosity about the world beyond the US after hearing about other cultures and languages and seeing more of the world through my family’s and their client’s eyes. Fast forward to college, where I began studying social work because I’ve also always known that I wanted work with people and help others put themselves in better positions in life. However, I realized very quickly after doing “in-the-trenches” social work in the Bronx, that it wasn’t really what I wanted to do. When I had this revelation, I wondered, how I could find a way to still help others while not being the direct, first-line contact and fortunately I stumbled across the Thomas R. Pickering Fellowship in Foreign Affairs, which still exists today. Through the Pickering fellowship program, I returned to grad school and studied for dual master’s degrees in public administration and international relations with the caveat that upon graduation I gave back a certain number of years to the State Department. The foreign service hasn’t always been easy, and no job is perfect nor is the State Department a perfect place, but this career has always been more good than bad. That was my round-about way of getting there, and it was all due to the Pickering fellowship program that the State Department offers, with the sole purpose of bringing in more diverse foreign service officers - more diverse skills, ethnic and racial backgrounds, religious minorities, people from underrepresented geographic areas of the US, etc. This program was specifically designed with the intention of making the diplomatic corps more accurately reflect American society rather than perpetuating the typical “pale, male, Yale” stereotype. BI: What are some of the challenges you’ve faced during your career? LM: For me, many of the challenges I faced were related to being female, being a minority, and being young. When I first came into the State Department, I struggled with people feeling like they knew me based only on what they saw and the stereotypes they associated with my demographic. They had no idea about my ability, my capacity, the way I thought/think about things, nor about my talents. They thought they had me figured out because I was a black female with dreadlocks. I had to overcome many misconceptions and typecasts based solely on how I looked. Some people didn’t take the time to get to know me or look deeper into what I had to offer and what I was capable of. In addition to that, I had to the deal with being young. As I said, I came into this job right out of grad school, and I was managing fifteen people in my first posting. For my first few assignments, I was younger than all the people I had to supervise and had the least amount of experience. I struggled with figuring out how to establish myself as a credible manager when the people I managed had vastly more experience than me and had so much knowledge and institutional memory than I did at that point? I grappled with how to overcome that, and as a supervisor, demonstrating what I had to offer? I had to learn to make the case that despite being young and inexperienced, I was there to streamline, elevate, and improve the communication between my staff and the senior managers to make sure they understood how my staff contributed to the mission and to guarantee they received the credit for the work they did. Thankfully this approach worked, and I was able to establish myself as a supportive and competent manager. In my second tour, I directly managed over sixty people and maybe at most five of them were female. It was a very machismo society and a male dominated, male oriented country and work environment. That posed an additional challenge in establishing my authority. As I’ve continued in my career, though I’m still younger than most of the people I supervise, I’ve been in the game long enough and people recognize what I bring to the table and they don’t question my inexperience or “newness” anymore. Also, at this point, I’ve had the time to develop a reputation, which precedes me in most cases, so people know what they’re getting instead of basing their ideas of me on what they see alone. Another thing that has been challenging for many has been entering the service as a single female of color. I was fortunate because, I came into the service already in a relationship with the person who is now my husband, but I think for single females this can be difficult lifestyle. It can be isolating and it can be lonely depending in which country you end up serving. As a woman of color, there are some countries with a certain level of xenophobia and racism, so the dating pool is much harder in that it may be more limited and sometimes it’s harder to find people who you are interested in getting to know better. That can be a challenge. Another thing that can be difficult as a young person starting out in this career is the expectation that, because you’re young you are more available and therefore you can be called upon to work long weekends, work overtime, or at night because maybe your office counterparts have young children or whatever. You are expected to be the one to sacrifice so your other colleague(s) can go home. To some extent that is okay, because you have to pay your dues, but at the same time, you don’t have to be martyred just because you’re single. You need your own time too, and that can be a bit of a challenge. The State Department often attracts a fast-paced, hard-charging, type-A, driven person, motivated to succeed, so it can be difficult to work in a system where it is more about length of service than it is about the right jobs that position you to move up quickly. That is not the way government works, and that exercise of managing expectations can be challenging for new officers because you come in at the beginning thinking you can change the world, and you have the desire and passion to do it, but the system is not designed like that. Diplomacy is slow; it’s a marathon, not a sprint. It’s slow moving, foundational work that requires long-term planning and relationship building, it just takes time. For people who come in thinking in ten years they’ll be an ambassador, they’re not going to have an easy road because that’s just not how it happens. I would say those are some of the challenges. BI: How would you define feminist foreign policy? LM: For me, feminist foreign policy is women-centric, women-focused policy, written and driven for and by women. BI: Would you consider yourself to be feminist, and if so, why? LM: I think so because I believe women can do any and everything that men do, and in many cases, women do things better. In many examples, the outcome would be so much different (and better) if a woman were the one taking the initiative, leading, making the decision, or executing it. Women just go about things differently than men do, and a woman’s perspective is one that we could use in all spheres - foreign policy, domestic policy, government, private sector, academia, everywhere. I hope I live long enough to see the day where real change is manifested, where in the US Congress half of the senate and half of the house of representatives are women. I want to be alive the day we have our first female president in the US. I want my daughter to see all these things too because I don’t want to feel like I’m lying to her when I tell her she can be or do all those things. I’m an egalitarian as a parent, first and foremost, as I don’t want the possibility of the American dream to be true for my son and not for my daughter. Also, I’m a feminist because I believe women are dope. Women can do literally anything, and we do it with ease. I know this because that is what I do, and it is what a lot of women I admire do. It doesn’t mean that men aren’t great in their own way, but it is time to let go and let us take over for a little bit and see what that looks like. I truly believe in the depths of my soul that it would look at least a little better than the present outlook we are presented with. BI: How do you stay motivated in your goals, career, and passions? LM: There are definitely some days where I think what am I doing? I just want to eat a bowl of ice cream and watch a good movie or read a good book and live a “normal life.” But it boils down to the fact that I want my time on this earth to mean something, I want to make a difference and make things a little bit better than they were when I got here. Also, now that I have kids, I want to leave a legacy for them. I want them to be able to look at me, not just as mom, but also as a person who they could admire and look up to. I want them to look at me and say look what my mother did - and not just for them but for all little kids of color and for all women who want to become foreign service officers or diplomats. I want to make a difference and do my part. Also, I enjoy it. I enjoy all the different things that I do. If I get to a point where I don’t enjoy it any longer, then maybe my calculus will change. But right now, I really love being a Cultural Affairs Officer, blogging, being a wife and a mother, and pursuing other hobbies and “side hustles”, like I’ve picked up my guitar and am playing tennis again. I’m motivated because I’m doing things that make me happy, and if it makes me happy I’m going to keep doing it. BI: Do you have anything else you want to add? LM: I would like to add that I want more women to come into the foreign policy arena - through think tanks, academia, the foreign service, military, etc. We need you and there is room for you to make a difference and share your voice. I’m available online and happy to speak to anyone interested in learning more about careers at the state department. You can find me on LinkedIn, through my Cultural Affairs Officer page, on Facebook - all under Lia Miller. I’m more than happy to lend an ear or offer advice to any woman who is interested in the international affairs, national security, or foreign policy arena. To stay up-to-date with Lia and her work, follow along at her Blog, Facebook, Instagram, Twitter and LinkedIn.